Wind into the Grid by Günther Hacker is an E-book in English about his experience trying to use a small wind turbine for his home in Germany. The experience led Hacker on an odyssey of experimentation with a wide assortment of wind turbines and eventually a decision to make a career out of his onetime hobby. Hacker had asked me to review his book in early 2014. It was a bad time for me. I was deep in the midst of rewriting my own book and couldn’t afford the time. Worse was when I skimmed some of the pages and saw that he started out with rooftop turbines. I’ve railed against rooftop turbines for years and it was like waving a red flag in front of a bull. Then I saw that he tested a number of turbines in the wind tunnel at the University of Stuttgart—another red flag. I’ve been complaining about so-called wind tunnel tests for three decades. They simply don’t show what a wind turbine will do in the field. Hacker was insistent and asked me again to take a look at his E-book. So, I skimmed the updated version again. He redeems himself eventually. He too concludes that no one should be fooled by inventors touting “new” technology that’s the latest fad on the internet, such as the Energy Ball. I was warming up to Hacker. When many of his experiments failed, he was led—as I was more than a decade ago—to begin testing small turbines on his own. Now this is a lot of work—and it doesn’t make you popular with either the manufacturers or the true believers in a particular product. Then I found that he wisely concluded that roof mounting is a bad idea. Kudos. He finally won me over. You never know what you’ll learn when you go through something like this. I found that in one of Hacker’s installations he used a very interesting screw anchor. It took three years for Hacker to get a wind turbine he was satisfied with. Along the way he found a new career. An outline, screenshots and sample pages can be found on the author’s website. 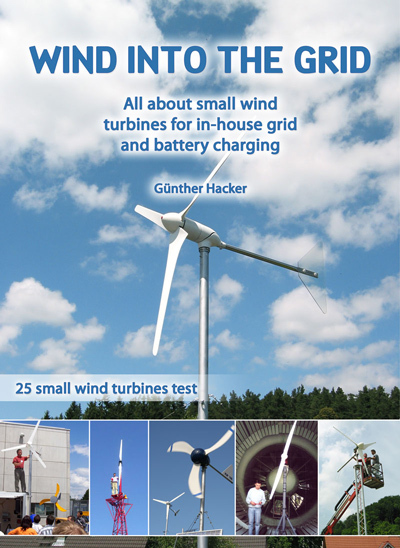 Wind into the Grid: all on small wind turbines for in-house grids and battery charging by Günther Hacker, epubli GmbH, 2013, 185 pages, format: epub or mobi; ISBN: 978-3-8442-8773-8, 7.99 €, 10.4 MB download.